All of us at Lynch Ryan hope you are enjoying the holiday season. As our year end wrap-up, we are revisiting some of our popular posts, as indicated by post clicks. Thanks for your interest and support in 2011, and we’ll see you around the bend! Have you protected your employees from this seasonal peril? Medical Marijuana in the Workplace: Dude, Lock Me Out! We’ve been blogging for more than 8 years, but our stat counter has only been tracking for about half that time. In that time, we have recorded 1,356,748 visits. Below, we’ve posted the all-time favorites over the 4+ years we’ve been tracking, along with the number of visits to each post. There are no duplicates with the above list. Since about 85% of all visits come from search engines, the list gives you a pretty good window into what types of things people are searching on for worker’s comp topics. 26,766 – You’re fired! Should you terminate an employee who is on workers compensation? 21,138 – Independent Contractor or Employee? 18,180 – Carpal Tunnel Syndrome: Who Should Pay? 7,607 – Can You Terminate an Employee on Workers Comp? 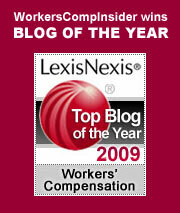 5,258 – Heart attacks on the job: are they covered by workers compensation? 3,825 – You think your job is tough? 3,671 – Poppy Seeds and Drug Testing: False Positives? 3,596 – Underwriting for Dummies? 3,540 = The Comp Success Story in Massachusetts: Who Pays? Raymond Letellier co-founded a steel fabrication company in New Hampshire called Steelelements. The company suffered a major fire in March of 2007. They rebuilt, although the cost of the rebuilding, managed by Letellier’s partner, exceeded the budget. In October 2009 the company went out of business. Throughout the long, downward spiral, Letellier suffered from stress, hypertension and depression. Soon after the company’s failure, he filed for personal and business bankruptcy. At the same time, he applied for workers comp benefits. Letellier’s claim was initially denied, then accepted for the medical costs only, and then denied again. Eventually the claim reached the New Hampshire Supreme Court, where a deeply divided court (3 to 2) ruled against Letellier. The court reasoned that the failure of the company was akin to a personnel action: workers comp does not cover such employer actions as discipline, termination and lay off. In closing the business, Letellier subjected himself – and everyone else – to a lay off. – a non-compensable personnel action. Two dissenting judges pointed out that the majority focused almost exclusively on the ultimate failure of the company, the lay off itself. But the extraordinary and relentless stressors in Letellier’s life began with the fire and continued throughout the struggle to keep the over-leveraged company in business. This is not the stress of a single event, but the cumulation of stress over months and years. The dissenters noted that Letellier’s commute to the factory was 100 miles, so he often slept in his office, where ever-pending doom haunted his every waking moment and his troubled dreams. They opined that his multiple health issues were predominantly caused by work. Letellier, once the proud owner of a successful business, finds himself in the same situation as laid off workers across America. He is on his own and out of luck. We will set aside for the moment what may be Letellier’s biggest mistake: instead of trying to make things that people can actually use, he should have pursued a career in finance, where he could have sold worthless mortgages, watched his company flounder, and then be rescued by tax-payer bailout, all the while preserving a superbly inflated salary. That’s an All-American story of a different sort, albeit fodder for another day. Rehabilitative robot roundup: Coming to a hospital near you? From time to time, we like to take a look at the wizardry that is under development in rehabilitative and assistive technologies. What used to be on the order of Flash Gordon type fantasy is now reality within reach. In out first clip, Toyota Unveils Quartet of Healthcare Robots. MedGadget says these four robots are expected to be production ready in 2013. Three are walking assist and balance training robots that would help in patient rehab. The fourth is a patient transfer assist – something we see as very valuable in helping to prevent health care worker injuries. And while on the topic of lifting aids, we’d be remiss if we didn’t include RIBA, a versatile if somewhat surreal patient care robot. Finally, we have a Robotic Man’s Best Friend to Guide the Blind. Yes, it may cost a bit more, but think of the savings in dog food. All joking aside, it’s exciting to see these technological advances moving closer to the practical reality of helping people to overcome injuries and disabilities. Posted in Disability, health care, Research, Videos | Comments Off on Rehabilitative robot roundup: Coming to a hospital near you? Our favorite “down under” blogger Russell Chatswood has posted the latest and greatest issue of Cavalcade of Risk at his Chatswood moneyblog. Now despite the mild weather we are enjoying right now in the northeastern U.S., we are envious of Russell’s blooming garden, as evidenced by the photos in the post. And beyond the flora and fauna, there is your garden variety biweekly grab bag of risk-related posts from around the blogosphere. Check it out. After a Thanksgiving hiatus, Health Wonk Review is back with your biweekly view of what the healthcare policy wonk’s have been blogging about. Brad Wright hosts Health Wonk Review: Holiday Shopping Guide at Wright on Health. Workers Comp Networks – At Managed Care Matters, Joe Paduda has been front and center covering the matter of Aetna’s exit from workers comp and his post today, Aetna part 2. Also related, his post about Where work comp networks are headed. UBB Report followup – In followup to yesterday’s post, here is a link to the MSHA Upper Big Branch Investigation Report – it’s a detailed account, including transcripts of interviews. Bloodborne Pathogens – According to the CDC, about 385,000 sharps-related injuries occur annually among health care workers in hospitals, and the average risk of bloodborne infection following one of these injuries is approximately 1.8%. The NIOSH Science Blog posts about needlestick punctures and bloodborne pathogens, highlighting the film Puncture which is about the personal injury case of Vinessa Shaw, a nurse who contracts AIDS after an accidental stick. The post calls attention to the NIOSH injury prevention initiative, The Stop Sticks Campaign. which is aimed at clinical and nonclinical health care workers and health care administrators in hospitals, doctor’s offices, nursing homes, and home health care agencies. Pole Dancing: – A Georgia Court recently ruled that Pole Dancers are not independent contractors. “The Judge found the club exercised control over the dancers because the amounts charged by the dancers for certain types of dances were set by the club. The club also established what amounts had to be paid by the dancers to the DJ and to other employees of the club each day at the conclusion of their shift. The club could also fine or fire the dancer for not coming to work or being late. The Judge also noted that every other FLSA case brought by exotic dancers from Alaska to Florida had concluded they were ’employees’, and not ‘independent contractors’.” Note: This is not the first pole dancing issue we’ve covered. My colleague posted about another claim with a pole dancing angle last May. This should lead to some interesting search results in our logs – not to mention some disappointed searchers. Brain Trauma – the New York Times has a 3-part series on 28-year old professional hockey player Derek Boogard’s death due to repeated head trauma, chronic pain and a deadly drug addiction. Read part 1 A Boy learns to Brawl, Part 2 Blood on the Ice and Part 3 A Brain ‘Going Bad’. There is also a related video: An Enforcer’s Story. For a good resource on preventing, treating and living with traumatic brain injury, we point you to Brainline.org. Related – In doing our rounds, we note that Dave DePaolo has an excellent post on Professional Sports and the Relevancy of Comp. In the I-guess-it-doesn’t-go-without-saying department – Slightly off track here, but Bob Wilson has a rather unusual warning that we are passing along as a public service: Beware the Door to Door Breast Examiner. Preventing Worker Deaths and Injuries from Contacting Overhead Power Lines with Metal Ladders – home holiday decorators also take note! A scathing report issued by the U.S. Mine Safety and Health Administration yesterday put the blame for the coal mining disaster that claimed 29 lives on “a workplace culture that valued production over safety.” The report characterized the coal mining disaster as “entirely preventable”, one that could have been avoided if long-standing and well-known safety standards had been followed. The report documents flagrant safety violations, routine coverups of violations, and intimidation of workers to keep them from reporting safety hazards and violations. “Outlining flagrant safety violations and a practice of trying to cover up major hazards, the U.S. Mine Safety and Health Administration officials cited mine operator Performance Coal Co. with 369 violations — including 12 that directly contributed to the disaster — and levied more than $10.8 million in fines. In addition, federal prosecutors announced a $200 million settlement with Alpha Natural Resources, the firm that bought Massey Energy. The settlement calls for $80 million to be directed to enhanced safety at all the company’s underground mines, as well as a dedicated training center and a $48 million trust to fund mine safety research at academic institutions. The settlement also includes $46.5 million in restitution for the families of the disaster victims. Key to the deal, though, is that — unlike a previous deal with Massey following the Aracoma Mine fire — the Justice Department is not agreeing to never bring charges against any individual executives, officers or employees of Massey or Performance. Goodwin said resolution of issues with Alpha allows prosecutors to focus their resources on potential cases against such individuals. All eyes will be on Alpha going forward. Their buyout occurred last June despite intense opposition, questions about events, and allegations of secret deals revolving around the $8.5 billion sale. Shortly after this deal, Alpha joined industry opposition to tougher safety rules. The report was issued on the 104th anniversary of the worst mining disaster in U.S. history – the coal mining explosions at Monongah W.V. that claimed 362 lives. While mining safety has improved in the decades since, yesterday’s report demonstrates there are many more improvements that could and must occur to protect workers. Opioid Abuse in Florida: Who Controls Controlled Substances? Florida is famous for at least three things: citrus fruit, sunshine and pain pills. The citrus and sunshine are pretty much permanent, but it appears that the easy dispensing of opioids may be coming to an end. HB 7095, the state’s new law regulating opioid distribution, bans doctor dispensing of drugs and subjects pharmacies to inspection of prescription records. The state is determined to put an end to its reputation as the pill mall of America. Now CVS, the giant pharmacy concern with over 700 stores in Florida, has stepped into the breach. They have notified a small number of doctors that they will no longer honor their prescriptions for opioids. CVS has analyzed prescription data and determined that these doctors are over-prescribing. As with so many issues involving insurance coverage, the data goes into a black box and a determination comes out the far end. What happens in the box remains a mystery. Our esteemed colleague, Joe Paduda, has strongly endorsed the CVS effort at his Managed Care Matters blog. Given the immense dimensions of the prescription drug problem in Florida, it’s clear that some doctors have long been abusing their power to prescribe medications. They need scrutiny and they need to be sanctioned. While CVS and other pharmacies are a key part of the distribution network, their leverage in this area is somewhat limited. To begin with, other pharmacies may choose to pick up the rejected business: we’re talking big bucks. In addition, CVS at some point will have to disclose the criteria used for rejecting the prescriptions written by certain doctors. Once this happens, doctors may attempt to manipulate their prescription practices to avoid detection and sanction. In attempting to get its arms around this formidable problem, the State of Florida has reframed the question about who controls controlled substances. While it’s apparent that doctors no longer have sole discretion in the area, it remains to be seen how effective and how equitable the control exerted by pharmacies can be. The Insider will monitor with great interest this important experiment in substance abuse control. Posted in Best Practices, health care, Medical Issues | Comments Off on Opioid Abuse in Florida: Who Controls Controlled Substances?